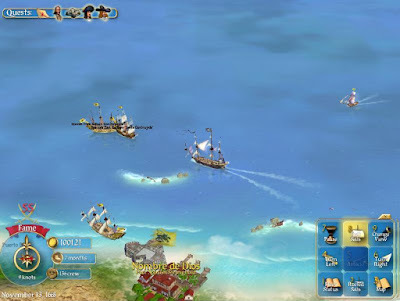 allround geek: Under Jolly Roger: Sid Meier's Pirates! Under Jolly Roger: Sid Meier's Pirates! Sid Meier has been one of the most influential men in the video game industry. He has given us blockbaster series and games that kept us awake in front of our computer night upon night, with the most famous being Civilization. One Sid Meier's series, though, has given us the chance to do what almost everyone that has ever been 10 years old always wanted to do, live the life of pirate! 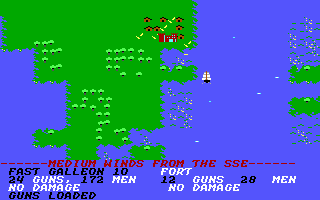 There have been 3 pirate games since 1987 with relatively very few differences between them as far as the gameplay is concerned. Basically you play the 1987 game the same way you play 1993 game and the 2005 game. You start of with a small sloop somewhere in the Caribbean and you head off to find treasures, pirate ships, wage war on enemy countries, and fool around with daughters of governors. Why would you ever need to change that? In the game you can play as any of the 4 countries in the region at the time (English, French, Spanish or Dutch). Depending on the Era you choose to start different countries have different difficulty. You can get a Letter of Marque and start hitting enemy ships. The dynamics change constantly in the Caribbean with peace treaties, new governors in towns, colonies changing hands so you have to be on top of the game in order to be survive. For example if you profit from a war and you know the there is a ship that transfers a diplomat that he is about to propose a peace treaty what do you do? Like any good privateer out there you hunt and attack the ship and continue to profit from the war. Besides pirating ships, though, you can occupy yourself with commerece. Get a big cargo ship find where each good is sold for a low price and where it is bought for high price start making your hard earned honest money. Why would you want to do that? Attack cargo ships, steal the goods and sell them to make profit! Arrrr! You can travel around the whole map of the caribean freely. You can literally go everywhere. Your ships speed and the route that you will choose will depend on the wind and your destination(which will piss you off when you want to travel to the east.) In your travels you 'll meet other ships that you would want to attack. When you engage them the same wind rules apply for handling the ship and moving it while in battle. You can use different cannons for different jobs (attack the sails , thin the men's number or blow it to hell). When you decide to board the enemy ship, depending on how the naval battle went, you might have to fence with the enemy captain. The graphics have obviously evolved over the past 20 years. The Caribbean is a stunning place. After long travels and battles you want to go back in a friendly town. In towns you can sell the goods that you stole and repair your ships(yes you can even have a small fleet). Besides that, you can upgrade your ships and recruit men from the tavern. You can even catch the latest news and rumors(pay attention to rumors as they usually involve information that you can profit from) and pay a visit to the local governor. There so much more that you can do in the game. You get hooked and you never get bored. Naturally in your travels you will come across treasure maps that you can consult to try and find treasures. The latest Pirates game has the additional quest of finding long lost family members scattered across the Caribbean. The games offers a truly fun and addictive gameplay. When you start playing it you will not be able to stop. As any good sandbox game it allows you the freedom to play it any way you want and enjoy it without any restrictions getting in the way. So if you want to have tons of fun living the life of a pirate give the game try. You can download the 1993 game for free from abandonia or you can buy the 2005 game for under 10 euros from many online retailers. YO HO HO and a Bottle Of Fun!! !